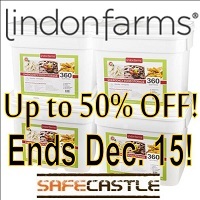 Up to 53% off Lindon Farms Freeze Dried 25-year Food! Up to 53% off Lindon Farms Foods! These are the biggest freeze-dried discounts we have to offer. Lindon Farms is the best economy-priced, top-quality, long-term storage food on the market. Moreover, they offer some fantastic, unique varieties unavailable anywhere else. We have never had a complaint about the food and it is one of the most popular brands out there.